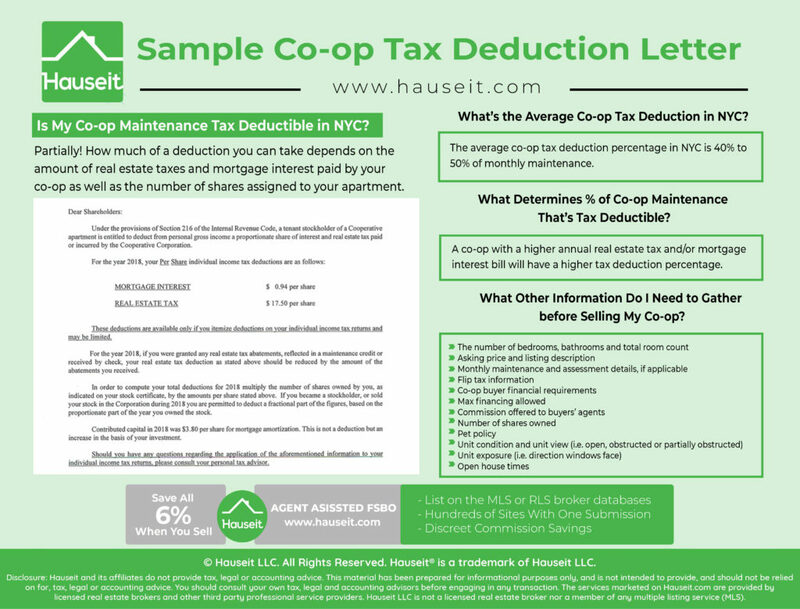 Co-op owners in NYC (also known as shareholders) typically receive an annual co-op tax deduction letter in the mail each year which specifies how much of a tax deduction each owner can take on their personal income tax returns. This letter is also referred to as a Form 1098. The tax deduction amount is based on the amount of mortgage interest and real estate taxes paid by the co-op corporation each year. 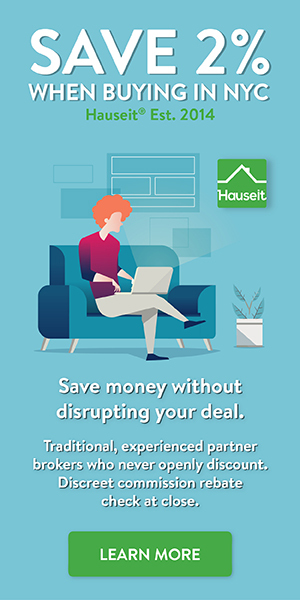 Calculate your annual co-op maintenance income tax deduction using Hauseit’s Interactive Co-op Tax Deduction Calculator. The Form 1098 specifies two dollar deduction amounts: one for mortgage interest and another for real estate tax. A co-op owner calculates her or his dollar deduction amount by adding these two figures and multiplying the result by the number co-op of shares owned. Buyers, sellers and listing agents in NYC commonly refer to a co-op’s percentage of tax deduction for monthly maintenance (as opposed to the dollar deduction amount) in order to more easily compare this figure across different listings. The percentage of tax deductibility of maintenance is calculated by dividing a co-op apartment’s annual tax deduction dollar amount by the annual sum of a co-op’s monthly maintenance payments. Is My Co-op Maintenance Tax Deductible in NYC? What’s the Average Co-op Tax Deduction in NYC? What Determines % of Co-op Maintenance That’s Tax Deductible? What Other Information Do I Need to Gather Before Selling My Co-op? Partially! How much of a deduction you can take depends on the amount of real estate taxes and mortgage interest paid by your co-op as well as the number of shares assigned to your apartment. As a co-op owner in NYC, you’ll receive a Form 1098 each year from the co-op’s accountant. This letter will provide you with the real estate tax and mortgage interest deduction figures which will allow you to calculate your annual dollar tax deduction amount. 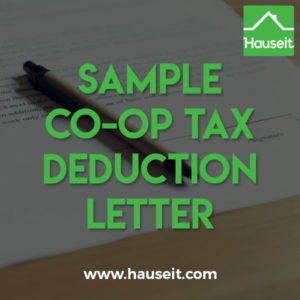 What does a sample co-op tax deduction letter look like? Is it the same as the Form 1098 your co-op mails you for tax season? Pro Tip: Your cooperative corporation or your building’s management company should mail you your co-op tax deduction letter by January 31st of each year! Pursuant to the provisions of Section 216 of the Internal Revenue Code, a tenant stockholder of a cooperative housing corporation is entitled to an itemized deduction for a proportionate share of interest and real estate taxes paid or accrued by the housing corporation. These deductions are available only if you itemize deductions on your personal income tax return. If you owned your shares for less than the period shown above, you must prorate your deductions, otherwise multiply the number of shares owned by you, as indicated on your stock certificate by the amount per share stated below. *If you have received any real estate tax abatements such as the New York City Co-op and Condo Tax Abatement, School Tax Relief (STAR), Veterans Exemption, Senior Citizen Exemption or the NYC $400 Real Estate Tax Rebate, you must reduce your gross real estate tax deduction by those amounts. If you have any questions, please consult your tax advisor, we cannot provide tax advice to individual shareholders. Assessments for capital improvements constitute contributions to the capital of the corporation and may be added to the basis of your investment. Contributed capital in 2016 was $0 Per Share. Please retain this letter for future reference. What's the Average Co-op Tax Deduction in NYC? The average co-op tax deduction percentage in NYC is 40% to 50% of monthly maintenance. 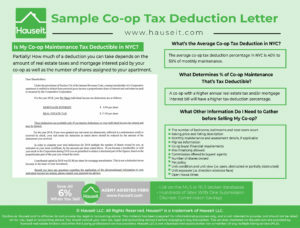 The specific tax deductibility percentage varies by co-op according to the amount of mortgage interest and real estate taxes paid by the co-op each year. If two co-op buildings pay roughly the same amount of real estate taxes but one has a much larger mortgage with a higher interest rate, the annual tax deduction percentage will likely be higher for the co-op with the bigger mortgage. What Determines % of Co-op Maintenance That's Tax Deductible? The percentage of co-op maintenance that’s tax deductible depends on how much in real estate taxes and mortgage interest is paid by a co-op building each year. Therefore, a co-op with a higher annual real estate tax and/or mortgage interest bill will have a higher tax deduction percentage. When you’re listing your co-op apartment for sale, you’ll need to know key facts about your apartment such as the number of shares you own and what percent of your monthly maintenance is tax deductible. Instead of guessing what percent of your maintenance is tax deductible or doing a complex calculation from the financial statements, simply retrieve the co-op tax deduction letter your co-op corporation mailed you. 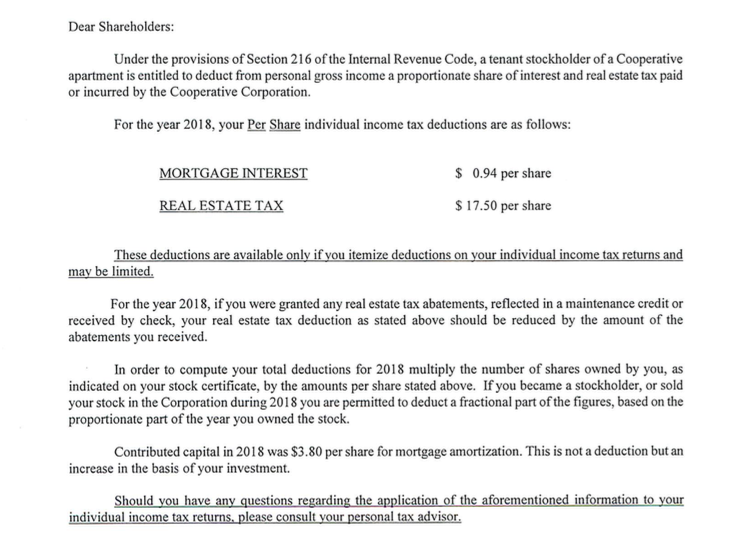 This co-op tax deduction letter is formally known as IRS Form 1098 and tells you exactly what portion of the building’s real estate taxes and interest you paid as a shareholder. As long as your co-op is compliant with Section 216 of the tax code and is primary engaged in being a housing cooperative versus other business activities, shareholders will be able to deduct their portion of the co-op corporation’s real estate taxes and interest! Learn more about the differences between co-ops vs condos as well as condops in our blog! Once you’re well underway with your sale, you’ll need more detailed information such as the building’s financial statements, a copy of the offering plan as well as the proprietary lease. The buyer’s attorney will need these materials to complete due diligence before your buyer signs the purchase contract. You can find a complete list of documentation you’ll need for your NYC co-op apartment sale in this article.